WAN VMotion – A Step Closer to a Private Cloud? 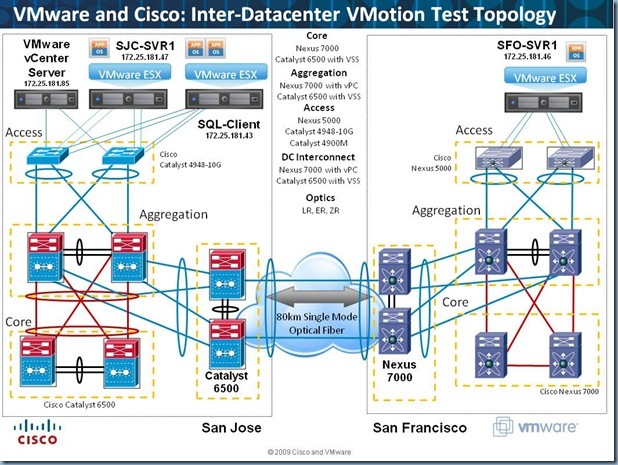 VMware has just released a joint Proof of Concept with Cisco titled VMotion between Data Centers. Just lately I’ve been doing a lot of extra reading about how Cloud computing is shaping and evolving and I believe this to be another step taken by VMware to closer themselves on becoming a “Private Cloud” solution. Will we soon be seeing Virtual Infrastructures spanning separate Data Centers? Unfortunately it doesn’t state the speed of the FC connection between the two Date Centers, but personally I think this would be the area which could cause the most issues in the future. Before I had my GbE switch at home I could easily do vMotions between hosts over an old 100mb hub, 100mb WAN connections (at least within the UK) aren’t beyond the realms of affordability for many organisations and 1Gb LES links also not too bad within the M25. I think if the bandwidth/latency issue can be overcome then i don’t see why VMotions can’t be performed over long distances on a daily basis. Having this available, business could now remove another single point of failure; The Data Center. Companies could split their Virtual Infrastructure between two different Data Centers in two different cities, countries, or even continents. Could this open the door to allowing large multi-national organisations to create a vSphere Infrastructure where their Virtual Servers are VMotioned around the Globe to their various Data Centers as an when they are needed? Therefore almost creating their own Private Cloud by being able to distribute servers on demand between physical locations. Virtual Servers could be used to follow countries work times, As London goes to bed Auckland wakes up and the demand for servers may increase. So why not VMotion unused London based Virtual Servers to the Data Center in Auckland? Sure enough this doesn’t increase the amount of CPU/RAM resource available as your not increasing the physical Hosts, but it can be useful in other ways. For instance, You could have a cluster of two web servers and suddenly one blue screens and fails reboot. Your website is now running on a single server and the load is doubled, now you can VMotion over a web server from another part of the world where the current demand is low. Once the broken web server is fixed, simply VMotion the borrowed web server back. I know there could be loads of arguments against this, e.g. Why not just keep a standby virtual web server locally or allow the single web server to use more resources etc. I’m not saying this is what should happen, i’m just trying to think about what possibilities would become available once VMotion can be used across long distances.